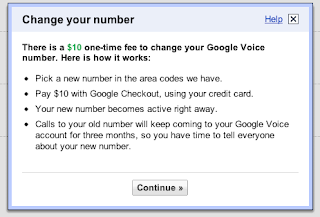 As of about two weeks ago, I joined the growing number of people with a Google Voice account. As I'm sure others know, there are some great features to this product, such as a unified phone number, online access to text messages/voicemail/call log, call redirection, etc. For those awaiting their invite, you'll be happy to know that you have the privilege of selecting your own Google Voice phone number. You can specify an area code (and GVoice presents you with a bunch of phone numbers within the one you chose). You can even enter any subset of numbers (maybe you just really want "90210" embedded in your number). But GVoice takes it up a notch: it lets you spell out a number with any alphanumeric mix (here's your chance to make your phone number U-CALL-ME or maybe DOTNET4 or whatever). There's one thing I wasn't aware of, though, that I stumbled into by accident today. Let's say you chose that super-snazzy number of yours. Like I did. Then, you had second thoughts. A quick trip to Settings presents you with a link to change your number. WSHEW! Not exactly what I was expecting. I guess I understand why the $10 upcharge is in place. Without it, I'm guessing Google would see people changing their numbers on a whim, and this could be a great opportunity for telephone spammers. Still, I thought I'd point it out, so that new GVoice invitees are "in the know" before committing to their new number.